Add a shopping tab to your Facebook page for complete integration of your social media marketing campaign and ecommerce business. Product information is fed and updated directly from your existing shopping cart. This add-on is the ultimate integration of your ecommerce shopping cart and social media marketing campaign! Our Facebook Social Commerce App adds a Shop tab to your Facebook page, creating a seamless extension of your ecommerce shopping cart. With a great group of features and included installation, it’s easy to see why this is one of our most popular add-ons. • Featured products - Call special attention to new, popular or special products. • Category navigation - Add categories and subcategories for easy product navigation. • Product search - Include a powerful search box to find products fast. • Real-time product data - Feed and update product data directly from you existing shopping cart. Facebook Social Commerce App is compatible with all versions of the AspDotNetStorefront shopping cart and supports topics for design customizations. 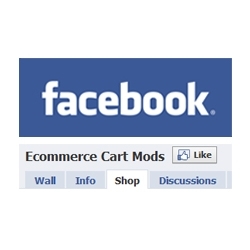 Reach more customers and create new opportunities for sales with a Facebook page shopping tab! Email support@compunix.us with the necessary credentials to access your web server and Facebook fan page. Really good add on. It pick up traffic in one week on my store. If you series about your business you need to have it. Awesome addition to our social networking !